The Battle of Cowan’s Ford was a battle in the Southern Theater of Cornwallis’s 1780–1782 Campaign that eventually led to the British Army’s surrender at Yorktown during the American Revolutionary War. It was fought on 1 February 1781 at Cowan’s ford on the Catawba River in northwestern Mecklenburg County, North Carolina, between a force of about 5,000 British and fewer than a thousand Americans who were attempting to slow the British advance across the river. The American general William Lee Davidson was killed in this battle. 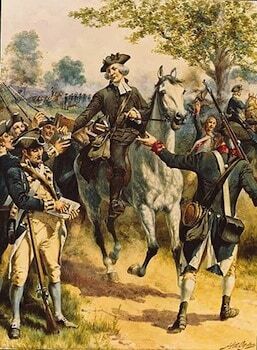 Following the Battle of Cowpens, Cornwallis was determined on destroying Greene’s forces. Cornwallis ordered his men to burn their supplies and pursued Greene in the “Race to the Dan” (The Dan River which flows through Southern Virginia and Northern North Carolina). During the preceding weeks, Cornwallis’s army had swung to the left and approached the swollen waters of the Catawba in late January. For three days, the British forces camped at Ramsour’s Mill, where they were joined by the remains of Banastre Tarleton forces. On 28 January 1781, General Daniel Morgan reported to General Nathanael Greene from his camp in Sherrills Ford that his forces had observed the British army moving towards the Catawba River. Morgan reported that he was attempting to collect the militia and delay Cornwallis’s forces from crossing the river. To this end, Morgan ordered General William Lee Davidson with 500 militia (two hundred and fifty of which were without flints for their muskets) to Beatties Ford. Cornwallis marched his forces eastward toward the river to Jacob Forney’s, where they camped for another three days after he had determined that the Catawba river at Beatties Ford was impassable because of the raging current. On 31 January, Cornwallis began to move his army despite the heavy rain fearing any further delay would cause him to lose his chance of destroying Greene’s army. Some six weeks after the engagement, Cornwallis wrote that he had ordered a detachment under Lieutenant Colonel Webster to “make every possible demonstration by cannonading and otherwise, of an intention to force a passage” at Beatties Ford while he would march down the river to Cowan’s Ford. General Greene arrived and ordered General Davidson,who had placed his men at the various fords along the eastern bank, to slow the British Army’s crossing of the Catawba River. 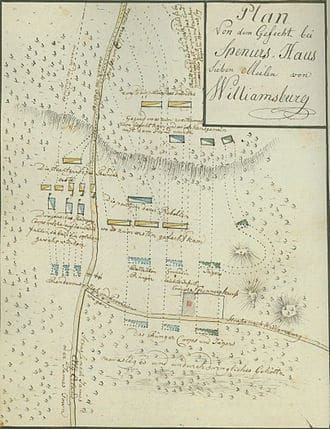 Greene and Morgan then left to accompany the bulk of their forces towards Salisbury, North Carolina. Davidson dispatched a company of cavalry and infantry southward four miles to Cowan’s Ford. The cavalry was to see that the British did not make a surprise crossing under cover of darkness. Toward nightfall Davidson joined the detachment at Cowan’s Ford. Davidson evidently feared that Tarleton’s troops might slip across the river in the darkness and get behind him, from which position they could attack him as the British infantry began its crossing and therefore set up camp a half mile from the river, with pickets watching from the water’s edge the Cowan’s Ford. Near daybreak, after a difficult march in which the British lost some of their cannon, Cornwallis’s army reached Cowan’s Ford. Cowan’s Ford was actually two fords; one, the horse ford, though shallower than the other, was longer, because it crossed the stream to an angle; the other, called the wagon ford, went straight across the river but was much deeper. Without hardly hesitating, the British began crossing the swollen stream straight across along the wagon ford and soon the horses were over their heads in the raging torrent. Davidson’s forces immediately began to confront the Redcoats. 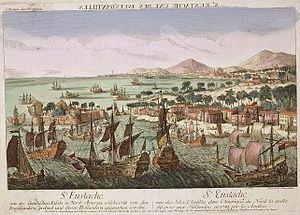 The militiamen were picking off many British soldiers as they struggled in the water to reach the far bank. After the first elements reached the bank and formed a firing line, they began to fire a volley at the now retreating militia. Shortly after arriving on the scene, Davidson was struck from his horse by a rifle ball through the heart. Oral tradition has it that a local Tory guide fired the fatal shot. Late that evening Davidson’s naked body was found. His corpse was evidently robbed by British soldiers, a fact established on 3 July 2001 when Davidson’s wallet was brought back from England where it had been held in the Public Records Office in London since the Revolution. General Davidson is buried at Hopewell Church in Mecklenburg county, NC.